When I was 14 I was given a quilt. My great aunt gave it to me while my family was on vacation in Kentucky. Kinda surprising that Aunt Jane Ann would give an heirloom quilt to a 14 year old. But our family kinda lacks quilters, and I was one of the few. Turns out my family had unknowingly folded it wrong. 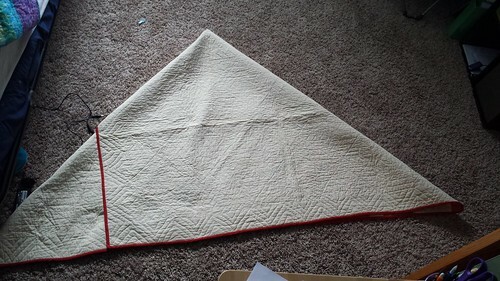 When I received this quilt, I read that you need to refold the quilt every couple months and that it is best to fold it on the bias to avoid getting that awful center crease down the middle. This helps save the textiles from more wear and tear than they need. I refolded it, the right way (well the way that I like this quilt to be folded) and I thought I would take some pictures to show you how I fold my quilts on the bias. 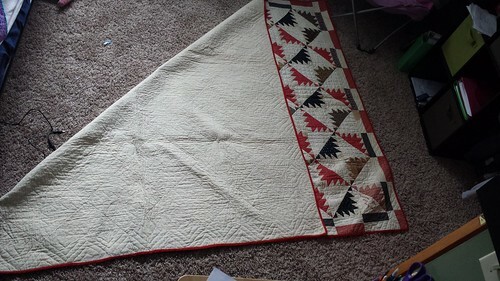 First here is the quilt. Isn’t it lovely? and the label on the front. As best as I can make out there are two embroidered signatures. 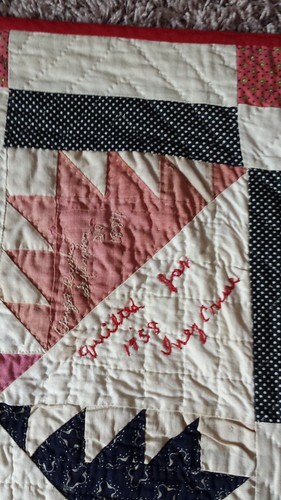 The first one says “Angela Reinhart September 29, 1884” and the second signature is “quilted Jan, 1958 Inez Cruse”. Ok now on to the folding. The first fold I take one of the corners and pulled it diagonally so that it makes a triangle. Because the quilt isn’t square there is going to be a little tail on the end. That’s ok. The next fold I grab the top right corner. Ya know, the one that is part of the tail, and pull it diagonally so it is even with the bottom edge like so. Now you have a triangle with out a tail. Next I grabbed the left bottom corner of the triangle and folded the quilt in half so that the left bottom point met the right bottom point. 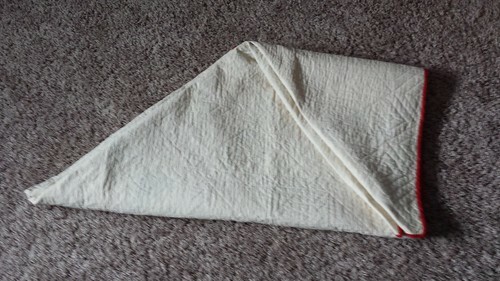 Next I grabbed the right corner and folded it down so that I could start creating a square which is easier to store than a triangle. Finally I folded the left corner up to meet the top right corner forming a square. 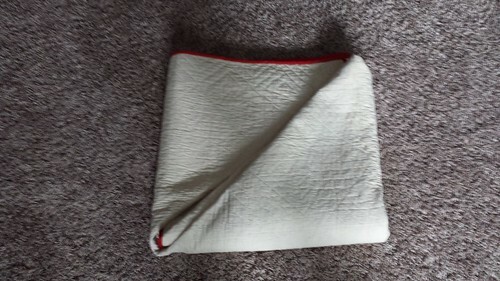 I try to pull out my quilt every couple months to refold it. To make sure you aren’t folding on the same creases just start on a different corner. The goal is to make sure that the quilt is folded on the diagonal which is stronger than if it is just folded in the traditional quarters. 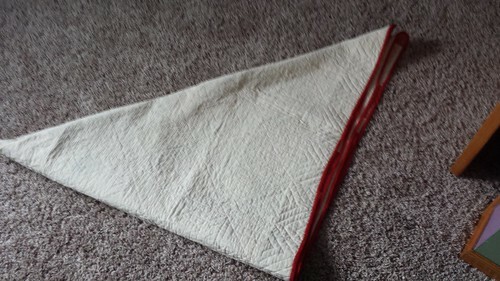 I decided to fold my quilt so that the piecing was in the inside to help save the color of the quilt, but if you want to display your quilt lets say in a china hutch folded like this you could just fold the quilt with the pretty side facing out. 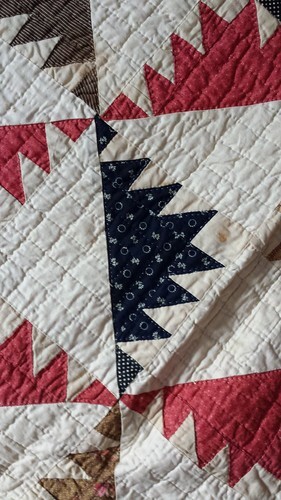 You are still helping to save your quilt because its is folded on the bias while you get to enjoy the loveliness of the piecing. 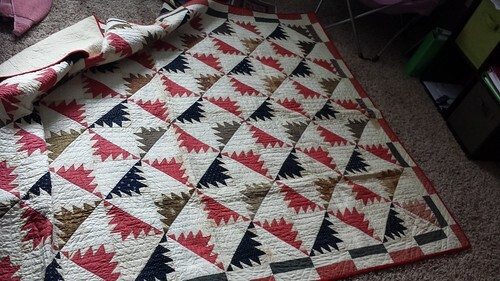 What are some of your favorite vintage quilts? Thanks for the folding tutorial! You are welcome! And thank you! that quilt is a treasure, and they can get fold lines and weakness. Funny about quilts, people are so careful with them, and I grew up mistreating my granny’s quilts because I didn’t know better. We took them on picnics, beach, etc, washed and dried them. She used to tell stories about her family washing them in big cauldrons over fire because she grew up poor on a farm in Alabama. They basically boiled them! Anyway, they lasted and lasted made from cotton. Shrug.